The study found that, for every 10,000 people undergoing a work capability assessment for sickness or disability benefits in those years, 7,020 were prescribed anti-depressant drugs afterwards, 2,700 reported to their GPs with mental health issues, and six committed suicide. The reminder came from a Vox Political commenter and was that the DWP already knew there had been a huge increase in the number of benefit claimants with mental health disorders. According to the Express, of all places: “In 2010 just 221,000 with mental disorders were in receipt of out of work benefits. But official statistics show the figure leapt to 861,000 last year  – a rise of 289 per cent. So the increase of 279,000 people with mental health problems, added to the 221,000 who were on benefit in 2010, gives us half a million people – easily within the 861,000 total for ESA alone. So figures that were published by the DWP itself totally support the new study. The second new thing was that the Conservative Government doesn’t seem to want to talk about it. Debbie Abrahams, shadow minister for the disabled, tried to ask an urgent question about the new study in the House of Commons on Tuesday (November 17) but was refused permission. So she made a point of order, asking the Speaker, John Bercow, how she could get the work and pensions secretary, Iain Duncan Smith, to make an early statement on the subject. Again, she was rebuffed – Bercow told her to table a written question and “if she remains unhappy with the answers—or, as she sees it, the lack of answers—she can try again to deploy the mechanism of an urgent question”. There might be a justification for not answering if the study had only revealed the extent of mental illnesses, which was known. But there is the matter of the 590 suicides. Is the work capability assessment driving people to their deaths? People killing themselves as a direct result of the work capability assessment – as the study indicates – is a serious issue, especially for a government that is still – increasingly desperately – clinging to claims that it is not possible to show that the WCA causes people to die, in any way. And nobody at the DWP wants to talk about it. 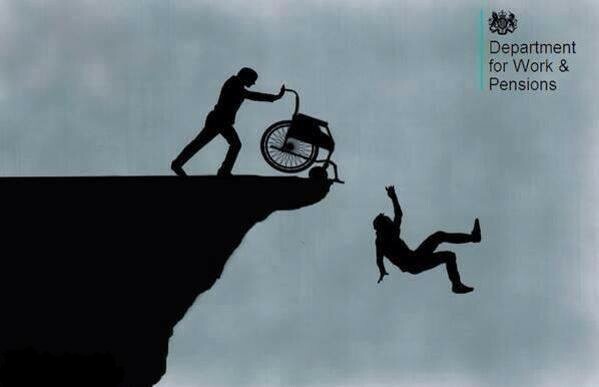 Let’s have that question again: Is the work capability assessment driving people to their deaths? Of course the WCA causes trauma and worsens existing conditions. I was affected in 2008 and I don’t believe that I could have been the only person. My MP was shadow minister for the disabled at the time and his staff were certainly well aware of my distress. Sadly at that time most interested parties either believed that the system was safe because it was staffed by doctors, just like them, who would put patients first, or were being bribed with government cash to provide the services that would get people like me back to work. I am lucky that I no longer need to claim social security but the lasting effect coupled with current government behaviour is that I live in constant fear of having to experience that system again. But yes they knew very well the effect WCA was having, why else was JCP represented on public health dept suicide prevention policy panels. It is perfectly obvious that the attitudes of the DWP towards defenceless people is doing everything but help them and is no more than a cover up for the overpaid salaries for those at the top of DWP which is not fit for the purpose it was set up for. How can we ensure that this research is brought to the attention of the UN’s investigator who is looking at this in the UK? The trouble is, I think they’ve finished their evidence-gathering. I’ll send the article to Jorge Araya and see what he says. Corporate manslaughter is the legal description of this evil regime’s actions. That’s against the law even here in the under-regulated UK, so we don’t need the UN to bring charges. Why aren’t the cabinet under arrest yet? Of course they knew but weren’t going to stop what they were going to do and are doing, they’re enjoying themselves far too much, are getting away with murder and the people of this country are letting them, no further word from both the UN and the EU, they’re another waste of time, people with mental health problems are on their own but nothing is new about that! I’ve been raging about this for well over a decade. If you go back to the government’s Labour Force Surveys from the end of the 80s into the 90s you will find a steady rise in the number of people being treated by their GPs for stress related illnesses whilst still able to work. Towards the end of the 90s there was also an associated increase in the number of people unable to work due to stress related illnesses. The BMA were one of many organisations to express concern about this. The government began implying that the increase must actually be due to more people faking illness to get incapacity benefit, despite it being an obvious inevitable result of increasing numbers of people in work suffering from stress related illness. The trend continued after 2000 and the Labour Force Survey started having a paragraph added saying that it was unlikely to be due to real increases in stress since “mental health morbidity” had not increased accompanied by pointers to suicide rates. Leaving aside the simple fact that mental health morbidity had actually risen over that period, soon afterwards the suicide rate began to rise too. It was already rising prior to the banking crisis of 2008.